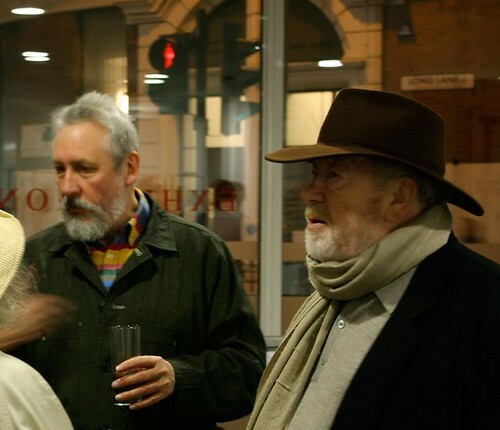 Last night Derek Birdsall paid tribute to Alan Kitching and Celia Stothard’s fifteen-year partnership at the private view for their new show at Advanced Graphics. 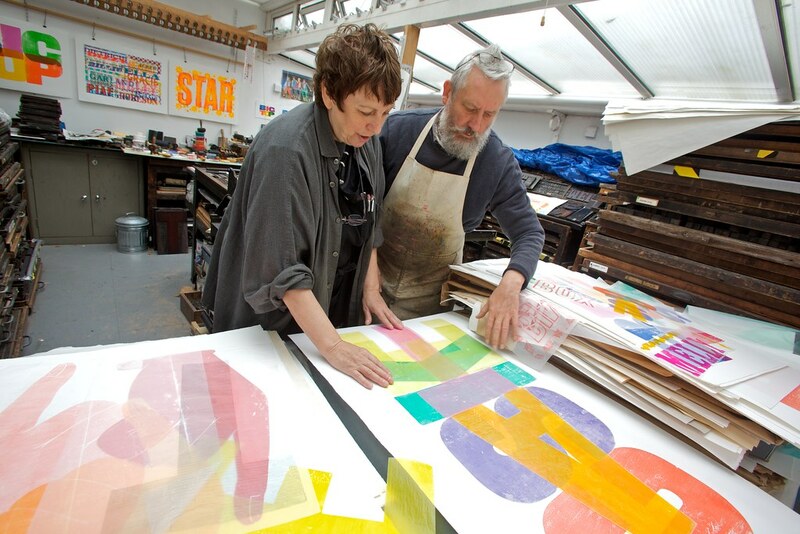 Top: Celia Stothard and Alan Kitching at work in the former alehouse yard now covered to create the Typography Workshop studio in Kennington, Lambeth. Photograph: Phil Sayer, for Eye magazine. 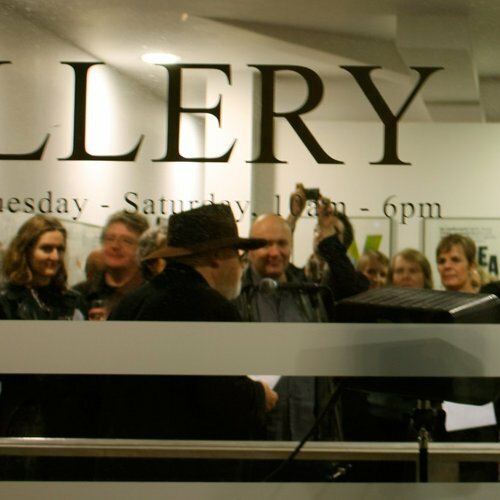 In a brief biographical sketch Birdsall (above, in hat) described Kitching as looking more and more like Eric Gill, and said that Stothard ‘sang like Piaf’. 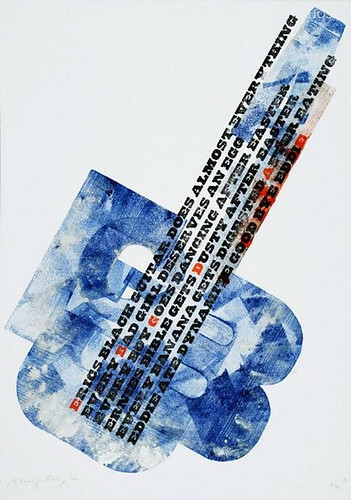 Kitching, said Birdsall, ‘breathed life into the dying embers of letterpress.’ Twenty years later, he was making fireworks. 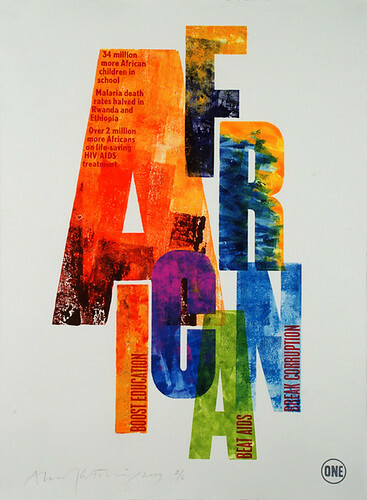 The visual evidence was all around us: dozens of vivid typographic prints, most for sale. Above: Kitching (left) and Birdsall. Kitching, in an equally short and touching speech, gave thanks to the RCA as ‘the only college where you can do what you like’, and to Stothard, who had rescued him from his former ‘vagabond life’. He described her as a woman of many talents – artist, singer, taxi driver – but recalled that he was particularly impressed, on visiting her flat for the first time, that she had built her own garden shed. 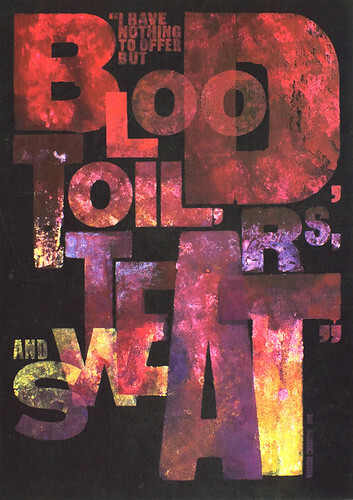 You can read more about their partnership, and how they came to acquire the massive ‘Wrington collection’ of theatrical wood type, in Celia Stothard’s ‘The show must go on’ in Eye 74, the Winter issue. 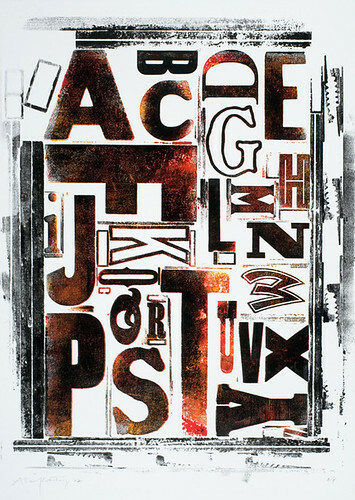 The exhibition continues until 19 December, so if you’re anywhere near London, go – before they sell all the prints. Amid the hubbub I located Celia, who wrote the piece for Eye, and congratulated her being the only shed-building jazz singer I know.